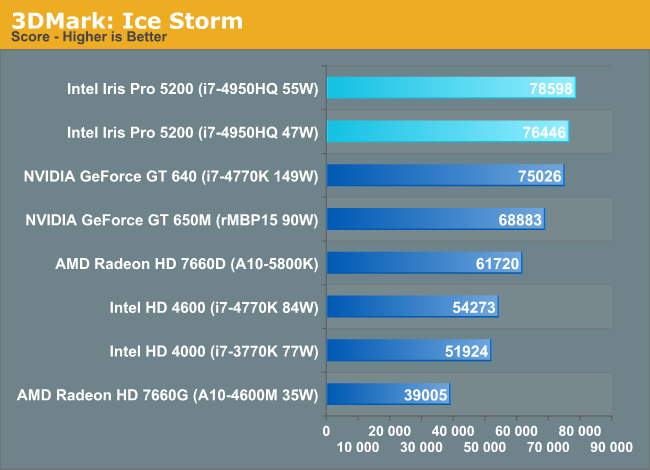 We don't use 3DMark to draw GPU performance conclusions but it does make for a great optimization target. 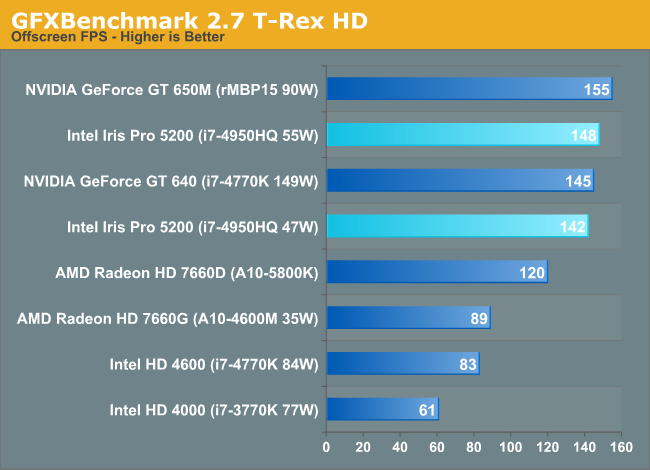 Given what we've seen thus far, and Intel's relative inexperience in the performance GPU space, I wondered if Iris Pro might perform any differently here than in the games we tested. 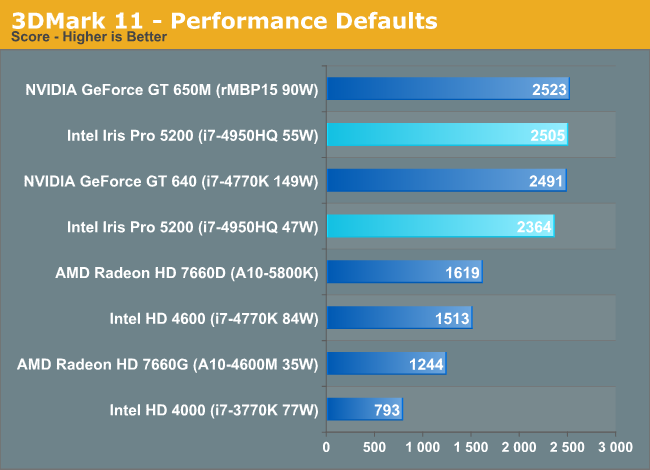 It turns out, Iris Pro does incredibly well in all of the 3DMarks. 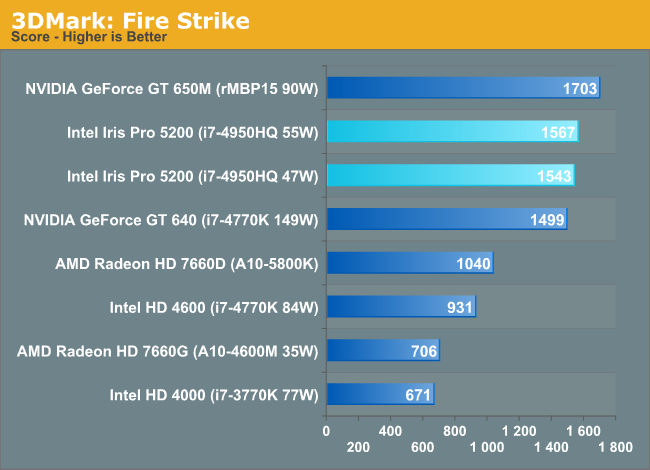 Ranging from tying the GT 650M to outperforming it. 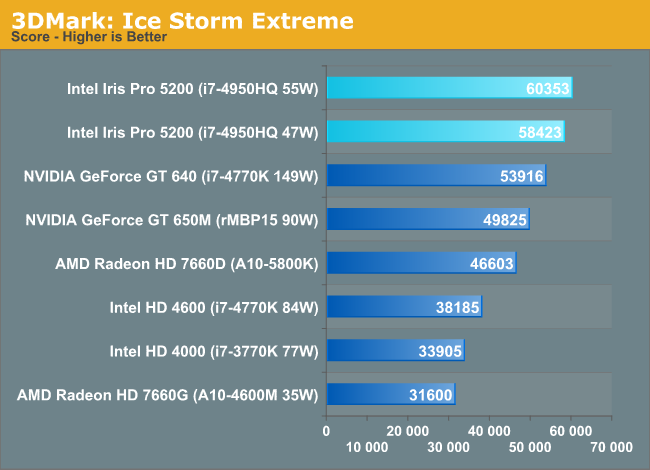 Obviously none of this has any real world impact, but it is very interesting. 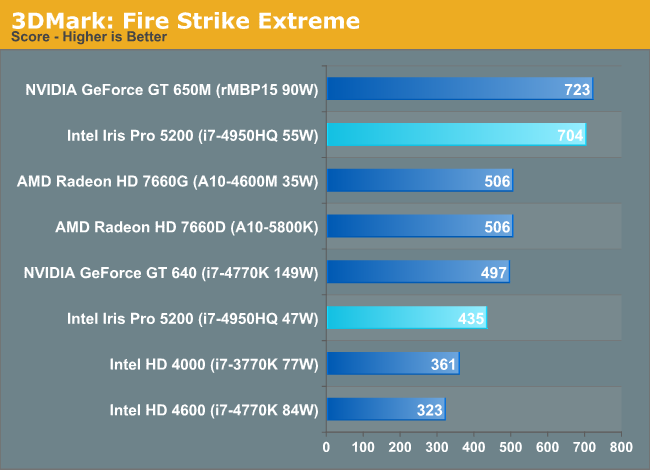 Is Intel's performance here the result of all of these benchmarks being lighter on Intel's weaknesses, or is this an indication of what's possible with more driver optimization? 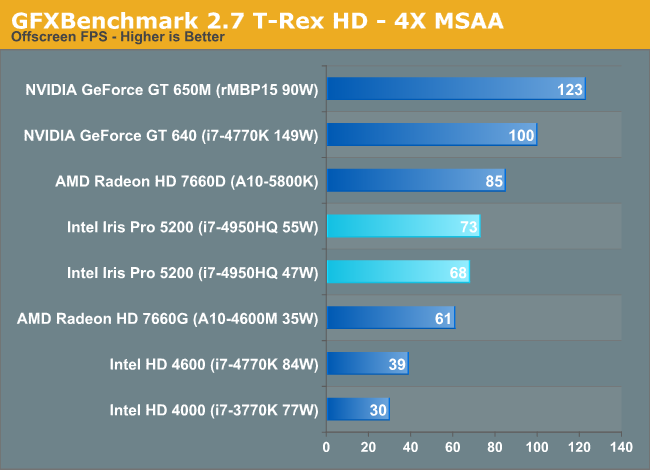 Iris Pro goes from performance competitive with the GT 650M to nearly half its speed once you enable 4X MSAA. 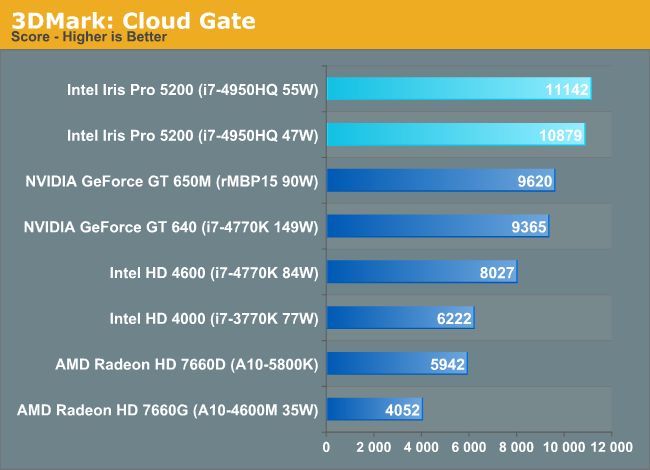 Given the level of performance Iris Pro offers, I don't see many situations where AA will be enabled, but it's clear that this is a weak point of the microarchitecture. 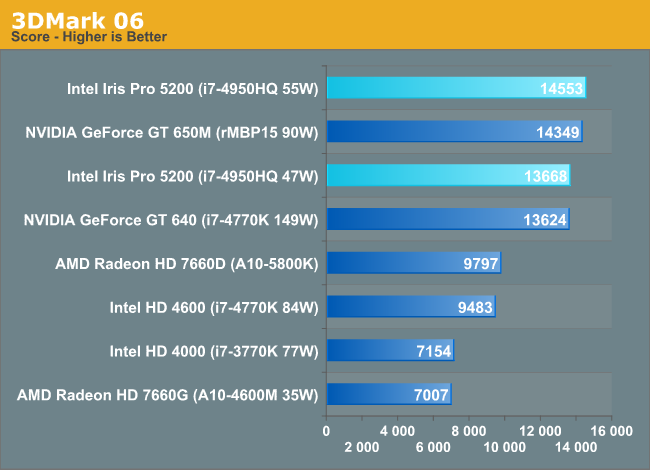 A 15" rMBP approaching the weight of a 15" Macbook Air would be very interesting, although a part of me hoped that Apple would wait until Broadwell to ditch the dGPU in the 15". They'll probably stick with the built in GPU for the 13" model and a discrete GPU for the 15" model, which is what they do right now.